Lots of FREE kids card games can be found on this site for you and your toddler to enjoy. You will find lots of FREE printable games for kids you can download and print out on this page and others. Some you can use for toddler party games and other toddler get togethers. They are perfect rainy day toddler activities. Lotto Games: To start with download the FREE kids Lotto cards (click on images below). You can print them on ordinary office paper but better still is thin card. This will make it a little easier for you and your toddler to handle. Then cut into 8 pieces with a picture on each. You will need to print off 2 copies of which ever lotto games you choose. This so you have 2 pictures the same 8 times. 1. You will now have 16 Lotto cards showing 8 different pictures. So you will have 8 pairs of lotto cards. Next shuffle your card up to mix them. Now place them face down on to your table top. A coffee table is a good place to play this game. A good height for both players or a group of toddlers. 2. You now take turns one at a time to turn over two cards only. The aim of the game is to get 2 matching lotto cards. If the picture cards were matching then they are put together in front of the player who found them. 3. If the two lotto card were not matching then they are turned back over but left in exactly the same place on the table. 4. The next player turns over 2 more cards again either 2 new ones or 1 new card and one of the original cards. The idea being to try and remember where they saw the last matching lotto card. 5. The toddler game continues until all matching pairs of lotto cards have been found. Finally the winner of the lotto card game is the one with the most matching pairs. This is a really great matching games for kids that they will love playing time and again. The best bit is that these are completely FREE kids card games. 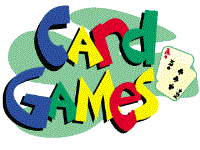 There are many other card games for kids on this site for you to use and enjoy. So go and get your free printable kids games now. To get your free printables click on any image below. Shapes Games for kids: These kids card games are another great idea for helping toddlers to learn some simple shapes. To see if very young toddlers understand matching shapes print out 2 copies. Then cut out the shapes from one print out.